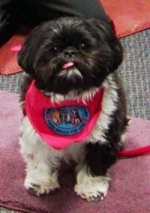 Murphy, a certified therapy dog, and her handler, Karen, will be in the children's room from 10:00 am to 11:00 am. Drop in and read her your favorite story. She is a great listener which is very encouraging for young readers.